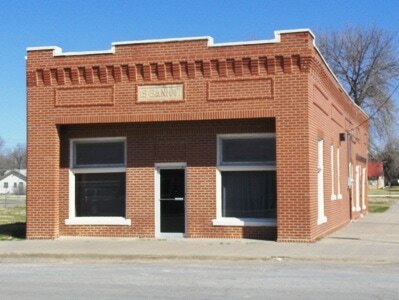 The Hunter Kansas, bank was originally established in 1914 in Victor, Kansas, as the Victor State Bank. Victor, a small town, was located six miles east Hunter. In 1917, the Victor bank Charter was shifted to Hunter and renamed. Of historical interest, the Hunter bank, was burglarized on May 30, 1963. The vault was broken into and over 50 deposit boxes were riffled through. The burglars also took 22 boxes, along with E.M. Quade’s stamp collection, valued at several thousand dollars, and $155 dollars in pennies. The FBI, the KBI, as well as local law officers, investigated the burglary. It was determined that the front door had been pried open and that an approximate 18-inch hole had been gouged through the thick concrete and brick bank vault wall. Five days later, 19 of the stolen deposit boxes were found by Rex Percival on his farm northwest of Tescott, Kansas, approximately 30 miles southeast of Hunter. The boxes had been pried open with some of the contents remaining in the boxes. The robbers were never caught. On February 18, 2009, the present-day bank closed its doors to business. About a year after the bank closed, the building was purchased by local residents. Today, the bank’s lobby and teller stations remain as they were when the bank was active. Other rooms in the building have been converted for lodging and event hosting.